Spacious luxury ground-floor beach-front apartment with large patio, private garden, pool and access to a secluded sandy cove. 2 bed/2 bath. Professionally managed with weekly housekeeping service inclusive. Highest quality furnishings throughout and fully equipped Italian kitchen. Electronic security gates and entry system. High speed wifi Internet access. Well located in the popular St Lawrence Gap famed for its restaurants and nightlife. Handy 'Welcome pack' included. Secure parking. My name is Nigel Warrilow and I am the owner of this wonderful apartment in Mistle Cove, Barbados. I first came to Barbados on holiday as a child and fell in love with the island. It has been a dream fulfilled to own a property here. The apartment is bright and spacious with stylish, modern furniture. It is professionally managed and I have an excellent housekeeper. Externally the property, gardens and pool are well maintained by the property managers, gardeners and specialist contractors. I have spent many wonderful holidays here with family and friends enjoying the warm clear water, stunning evening sunsets and the occasional sighting of a turtle laying her eggs on Mistle Cove beach and baby turtles hatching. Over the years I have gathered lots of local knowledge regarding the best places to eat, visit, shop, cycle, kayak and kitesurf, which I am always happy to share with my guests! On arrival you will be met and greeted by my apartment manager for a full introduction to the apartment, and you will receive a handy welcome pack of local groceries to get you started. I want all my guests to have the same enjoyment here at Mistle Cove that I also have. It truly is a little taste of paradise. The location is great! It is hard to adequately describe in words or photos just how wonderful the view is from the patio. The apartment is spacious, light and breezy and well maintained. The master bedroom is particularly special as it has great views directly in to the garden the sea and patio doors opening on to the balcony. The location of Mistle Cove is unique in many ways, it is a benchmark high-quality property on the South Coast ideally positioned close to, but not disturbed by the nightlife in the Gap. The property consists of only 14 spacious apartments and is gated at the front and secluded, benefitting from an almost private beach and each unit has wonderful views over the private garden, beach and the ocean. En-suite bathroom to master bedroom with bath, fully tiled shower, WC and vanity unit. 2nd with luxury shower, WC and vanity unit. Secure parking within gated car park. High-Speed fibre broadband with wifi internet access. Typical download speed 80Mbps, upload speed 15 Mbps. Spacious open-plan lounge/dining room with ocean views. Open plan Italian style kitchen with views through dining room, lounge and patio to the Caribbean Sea. Large oven, ceramic hob, American fridge/freezer with ice and cold water on tap. Dishwasher, microwave, kettle, toaster, coffee maker, blender, etc. Cable TV with multi-choice sports channels. Several golf courses within easy reach of property. Notes on accommodation: Air-conditioning in bedrooms included. Welcome pack included. Non-smoking apartment. No party groups. Please check the availability calendar before making your enquiry. You-tube video link available upon request. Outside: Pool not supervised. Gardens giving direct access to delightful secluded sandy beach. Sun loungers provided for garden and poolside. Secure parking at front of property. Utility Room: Washer/dryer, iron and ironing board. Cleaning / Towels / Linen / Housekeeping service. Bathroom towels and beach towels provided for 4 people. All bed linen provided. Weekly housekeeping service. Extra housekeeping service can be provided at extra cost. Outside: Large patio, table and chairs, sofa, chair and ottoman, overlooking gardens, with a few steps down to the delightful secluded sandy cove and the Caribbean Sea. We had a terrific stay. Great location and lovely grounds with view of the beach in front of the property. Spacious condo with great amenities .Support staff especially Rosa were very helpful. Would gladly stay there again. Having seen the photos and read previous reviews we had high expectations which I can say were exceeded. Every item in the apartment was high quality and in top class condition, including the balcony furniture. The building, gardens and pool are also very well maintained. Apartment 101 also has an enviable location with a view straight out to the very pretty beach, a nice place to go and sit and watch the turtles which were quite close to the shore. The apartment was kept in pristine condition, including linen changes, by the wonderful Phoebe. We also had regular contact from Carolina and everything from our arrival onwards ran really smoothly. We hired a car which was delivered to us, the rep came in to complete the paperwork and his first words when he looked out to the view was Wow! That says it all. We would most definitely stay here again, we've rented a lot of apartments / villas and this was right up there with the very best. You can sit on the balcony in perfect peace day or night or leave the building and right outside are plenty of bars and restaurants to keep you happy for a couple of weeks. We had the rear bedroom facing the car park and road and weren't disturbed by any noise whatsoever. All of our contact with Nigel was really easy and efficient, it was great to be able to pay in sterling, many thanks Nigel we had a fabulous holiday. We just returned from an 11-day stay at Mistle Cove 101 and we already miss it! 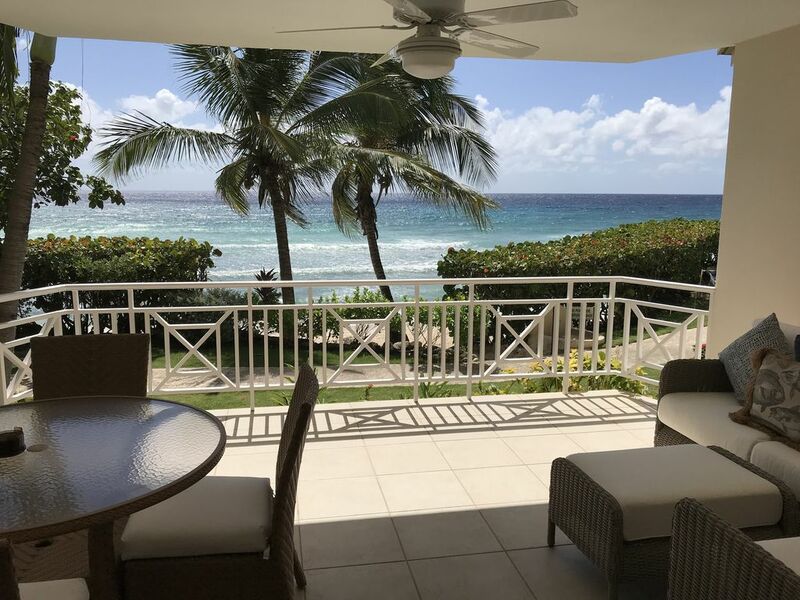 This apartment is just perfect: spacious,airy, peaceful, spotless and the closest accomodation to the sea we have seen yet in Barbados (this was my 7th trip to the island in 20 years). The view of and proximity to the waves cannot be beat - it is exactly as the photos depict. When you sit out on the porch, it's like being on your own private beach. It's also super conveniently located in the ever-active Gap, within walking distance to restaurants, bars, shops, beaches. We didn't rent a car this time and really did not miss it. You can walk to the end of the St. Lawrence Gap and catch a bus along the main road...straightforward and quick. While right in the heart of the Gap, noise was never an issue in the master bedroom because of the air conditioning and the sound of the sea outside the window! The bedroom closer to the street had some noise, but it was easily drowned out by the air conditioner and ceiling fan - plus, the kids were in there and they are heavy sleepers! We all surf and spent our days at nearby Dover Beach, which takes all of 10 minutes to reach by foot. The condo is very well-equipped, too. Nigel has thought of everything in setting it up; I was able to cook in when we felt like just hanging out at home and I lacked nothing. Mistle Cove is a low-key building with a mellow vibe and the other renters or residents there during our stay were all very respectful and quiet. It was the relaxing, rejuvenating atmosphere we were looking for. Thank you for everything, and we really hope to be invited back next year! We have found the perfect spot in Barbados! We had such a good holiday in this lovely apartment. The location is great, next to lots of good restaurants and bars, only a short walk to the beach. Nigel is a great host and was very helpful with recommendations on where to eat and places to visit. Thanks Nigel, we will be back!! Small secluded sandy beach with direct access from the garden. Frequented by turtles from June to November. Adjacent to Mistle Cove, just a short stroll along the Gap, is the 600 metre long Dover Beach, with safe bathing for all ages. Mistle Cove is 15 minute taxi ride from airport. A number of airlines fly daily to Barbados - midweek flights are often cheaper and less crowded. Numerous car hire companies available on the island. Approximately 15 minutes by taxi from airport. Approximately 4 miles to the capital, Bridgetown for Duty Free shopping. Excellent bus service to all parts of the island. Convenience store open 8am until 10pm next door. Internet cafe opposite. Supermarket and bank nearby. Superb choice of restaurants all within short walking distance. Taxes: Rate quoted includes applicable Barbados room levy at 10%. Payment Terms: 25% deposit required and final payment 30 days before check-in. Cancellation Terms: Cancellation at least 30 days before check-in - 100% refund of the amount paid. Cancellation between 14 and 30 days before check-in - 50% refund of the amount paid. Changeover Day: Flexible - any day subject to availability. Notes on prices: Rates shown are in UK Pounds.